"Great Greek dessert. 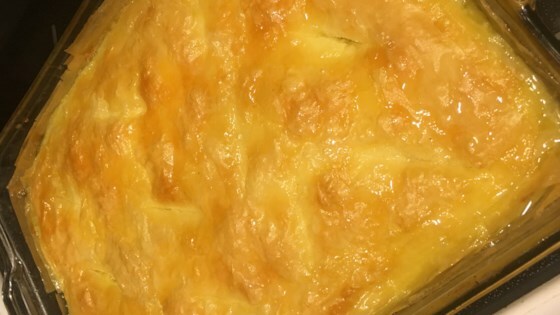 Lemony semolina custard in a phyllo crust with lemon syrup. The Greek traditional way of making it. I hope you will enjoy it as much we Greeks do!" Pour the milk into a large saucepan, and bring to a boil over medium-low heat. Remove from the heat. While you are waiting for the milk to boil, beat the eggs, semolina, and 3/4 cup sugar with an electric mixer until well blended. Use a wooden spoon to stir this into the hot milk. Cook over low heat, stirring constantly until it just starts to bubble. Remove from the stove, and stir in 2 tablespoons of butter and 1 teaspoon of lemon zest. Preheat the oven to 350 degrees F (175 degrees C). Butter an 9x13 inch baking dish. Brush butter onto 6 of the phyllo sheets, and place use them to line the bottom and sides of the baking dish. Pour in the semolina mixture, and spread evenly. Layer the remaining sheets of phyllo dough over the top, brushing each one with melted butter as you lay it on. Sprinkle a few dashes of water over the top. Use a knife to slice through the top layer of pastry in a diagonal pattern. Bake for 40 minutes in the preheated oven, or until the crust is golden brown. While the dish bakes, combine 2 cups of sugar, water, and remaining lemon zest in a small saucepan. Bring to a boil, and remove from the heat. As soon as the galaktoboureko is removed from the oven, pour hot syrup over it. Let it cool before serving. After it has cooled, store in the refrigerator. It will stay good for 4 to 5 days. The indulgent chocolate flavor is totally killer! I had absolutely no trouble with the recipe as it was written, I used less sugar, and less syrup because I'm not a fan of sweets. It was delicious, my family ate the whole thing in two days! It was very good. Although you shouldn't add to much of the syrup or else it will be quite sweet. It is very rich to but its good!